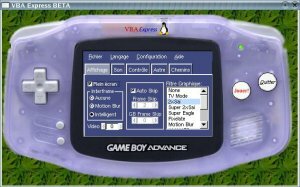 Welcome in the official web site of VBA Express, a front end to the best GameBoy Advance emulator VisualBoyAdvance for Linux. What's VBA Express? It's First, to configure VisualBoyAdvance (emulator)... EASILY! Graphics, sound, controls (keyboard and joystick), paths (to saves and captures)... You can configure all this without edit VisualBoyAdvance.cfg manually! Open your Roms (games) with the frontend! You can run the roms with "Play!" button (without using the console command VisualBoyAdvance game.rom).